The Anatomy of Color by Patrick Baty. Color energizes me and my art. I bought The Anatomy of Color by Patrick Baty as a Christmas gift to myself. The historic color charts are amazing and if you have pinned a color wheel photo on Pinterest it probably came from this book. Follow the author at @anatomyofcolour on Instagram to see more! 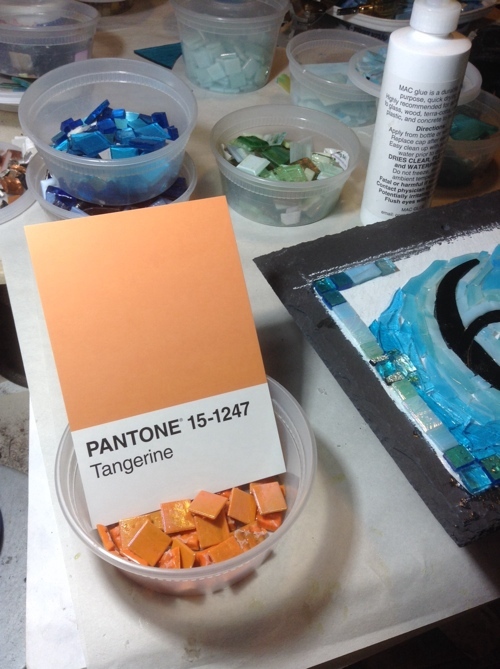 Tangerine Glass Tiles in the Studio. I have been on Instagram since 2013, and I started to notice photos matching objects to Pantone Color Postcards. This is the only card game I would enjoy playing. I ordered the box of 100 Pantone Postcards awhile ago, because I couldn’t resist a box of color, but I couldn’t bring myself to actually send them through the mail. The Pantone Project, as it is called, gives me a use for my cards. There is something satisfying about finding something that matches a card, or in finding the right card to match something that has caught my eye. Of course I started with orange! In reading about the history of this project, I discovered the artist who began it, Paul Octavious. Surprise, Surprise(2003) by Tim Bavington. Albright-Knox Gallery, Buffalo, NY. Photo by Wayne Stratz. I wanted to revisit the Albright-Knox Gallery which I thought I saw in 2007, but it didn’t look familiar at all. Fortunately, it was a place worth visiting for the first time. This painting is Tim Bavington’s translation into color from the structure of the guitar solo in the Rolling Stones’ tune Surprise, Surprise. 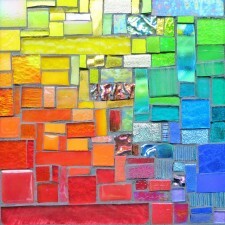 The artist creates connection between musical notes and the color wheel. 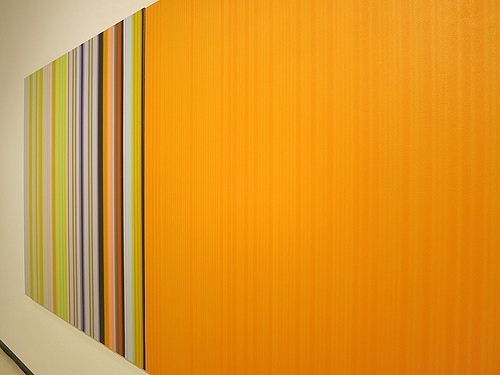 Stratoz took this photo at an angle to the painting, and the yellow-orange seems to turn to the camera and stare directly into the lense. Surprise, Surprise by Tim Bavington at the Albright-Knox in Buffalo, NY. Tennis Ball Yellow by Eric Minh Swenson, a short film about Bavington’s process, with cool views of his studio. Xanthocyanopia is a form of color blindness where only yellow and blue are perceived. As a child I used to wonder if other people saw the same colors in the same way, and how would we know. Virescent is like a mixture of two of my favorite words, iridescent and verdant. Virescent describes becoming green, a word of spring. 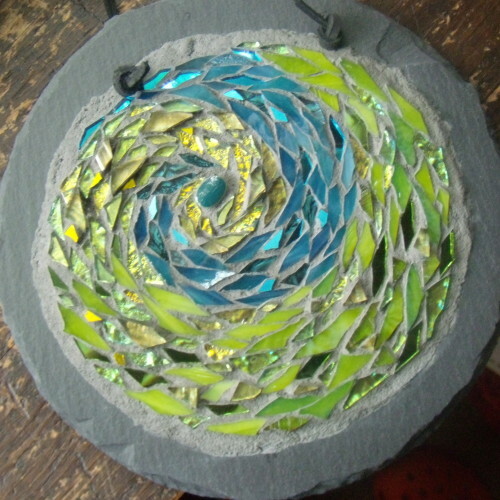 The way yellow turns into green is one of my favorite transitions when I am making mosaics. 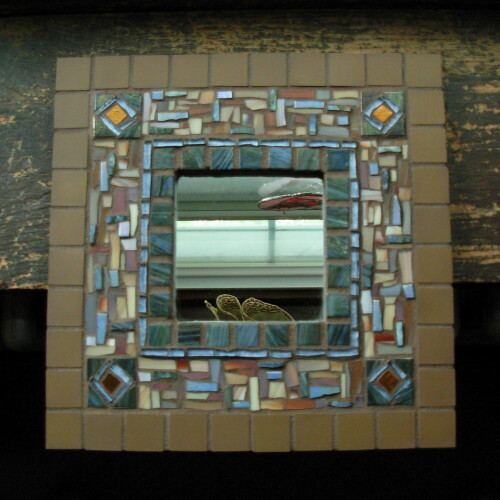 Umber and Blue Mirror by Margaret Almon, glass, copper smalti, and unglazed ceramic tile, 10×10 inches. Umber is an earthtone, an earth pigment. It’s odd how I can hear the names of “raw umber” and “burnt umber” and not realize it meant that one was in its “raw” state, and the other heated, to make a deeper tone. The outer tiles are Cinca unglazed ceramic from Portugal, and seem formed right out of the earth. A tint is created by adding white to a color to make it lighter. 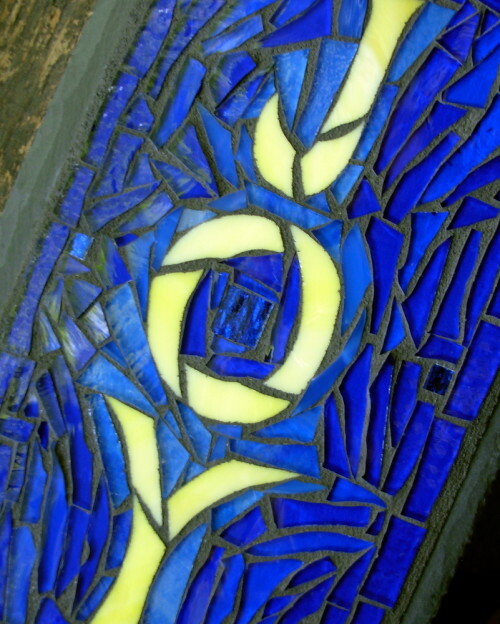 Some stained glass is made with white glass swirled into the color, making a particularly apt tint. 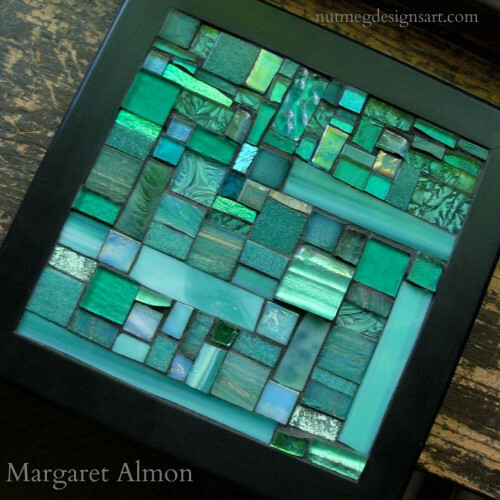 With this trivet, I worked with the whole family of teal tints. 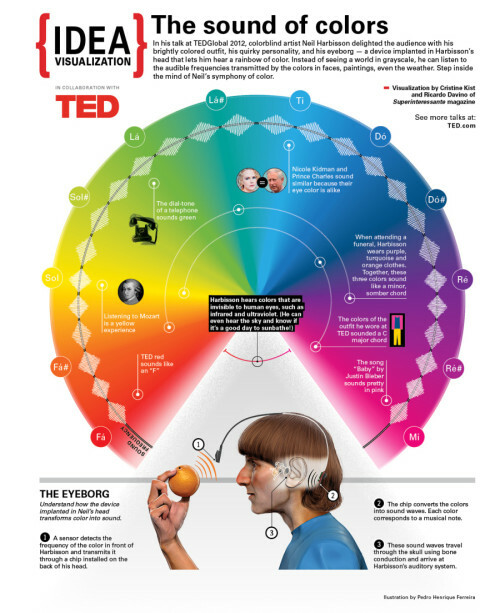 The Sound of Color: Neil Harbisson Visualized. Infographic by Cristine Kist and Ricardo Davino of Superinteressante magazine. Stratoz forwarded this TED talk by Neil Harbission, an artist who is completely colorblind. He created a way to translate colors into sounds, and the colors became such a part of him that he started dreaming in color. 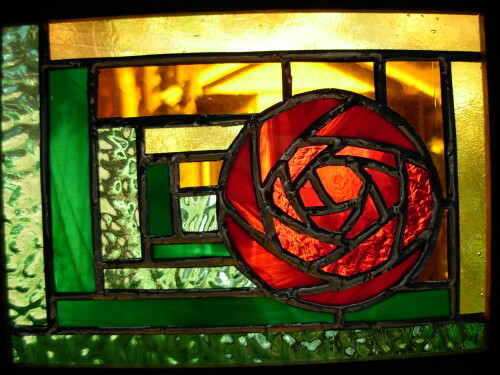 Mackintosh Rose Log Cabin Stained Glass by Wayne Stratz. Looking for an R for the A to Z challenge, I discovered rutilant: glowing or glittering with red or golden light. This stained glass piece by Stratoz captures both red and golden. I love finding a new word that has relevance to the art around me. 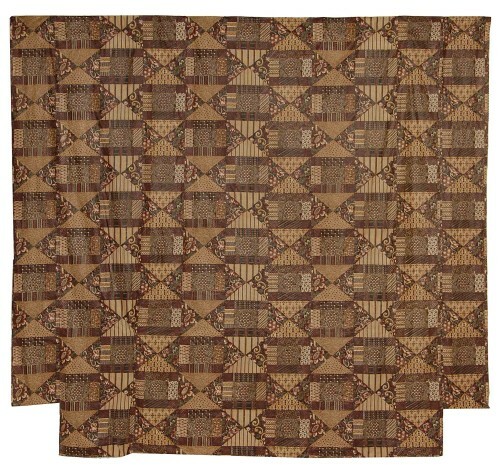 When I think of drab, I think of dull, but it actually refers to a color scheme made from quercitron dye, which includes shades of yellow, brown, orange and green. Quercitron was derived from the yellow inner bark of the black oak tree, and an Englishman observed the process in the US in 1785 and took out a patent in Britain, naming it after Quercus(oak) and Citrina(yellow). The type of mordent used to fix the quercitron dye produced the array of colors.